I have always enjoyed listening to BBC’s Desert Island Discs. For those of you who don’t know, this radio show is a British institution which has been running since 1942! On each episode, a famous person is cast away to an imaginary desert island. They are allowed to bring just eight music tracks, a book and a single luxury item. After listening to the eight music choices, the host asks the guests to save just one piece of music from the waves. I wonder what tricks we would choose in a magical version of this show? Obviously, we would have to assume there were people on this particular island for whom we could perform! So here are my eight desert island tricks and the one single trick I would save. In addition to the Change Bag and Mis-made flag silks, I suppose I would also need several jokey wands, but in a pinch I could probably fashion some of these from things found on the island. I can do a fun-filled 5-10 minutes with just this one trick and a version of it has been in almost every kids birthday party and school show I have ever done. There is so much opportunity for interaction with the child helper and so many funny lines and bits of business. I have performed many strolling gigs where the only trick I did all evening was my Ambitious Card routine with a Card to Wallet ending. I do a tight three-phase Ambitious routine which appears increasingly magical. Then, when they think it is all over, I hand them the deck of cards and offer to do a challenge where I never touch the cards. When the card appears in the zippered section of my wallet, it never fails to get a huge reaction. I have booked more repeat gigs and received more tips because of this trick than any other! I do the sponge balls in almost every kid/family show. I also perform it at strolling gigs for both adults and kids. Like the Ambitious Card, the secret of a good sponge ball routine is to have a small number of very clear phases. The audience must always be clear where they think the ball is. “Confusion is not magic” and it is certainly not entertaining. I close my adult shows with the Arm Chopper. I am a solo, “briefcase” performer. I don’t use large illusions or assistants. However, my platform show must work for large audiences in hotel banquet rooms and so I need routines which “play big.” The arm chopper is a great trick with lots of opportunity for comedy, but also drama. It is a perfect trick to use for the VIP, CEO, birthday boy, host of the party, etc. I truly love performing Fast & Loose, because while my routine has a basic structure, it is a slightly different performance every time. That is because my presentation hangs on the psychological wordplay I use to “persuade” my helpers to choose the wrong side every time. I do more improv with this routine than any other. It is a great trick for a close-up show, and it is my favorite routine to perform at trade shows. I have two coin routines which I regularly perform professionally. Coins Across and a matrix. I perform the routines separately, but I have also routined them into a single 5-6 minute presentation which is very commercial for both kids and adult audiences. I perform a straight-forward and direct mind-reading trick at my middle/high school shows and also my adult stand-up gigs. 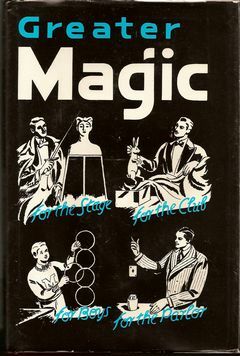 A lot of mentalism I see is horribly convoluted and contrived. If you are going to read someone’s mind, give them a book, tell them to pick a word and tell them what that word is. Done. So those are the eight tricks I would take to the desert island. I also get to take one magic book with me and that would be Kaufman’s reprint of Greater Magic. And the luxury item I’d take would be a pair of sunglasses. And what is the one trick I would save if all the others were washed out to sea? It would have to be a deck of cards and a Card to Wallet. I honestly believe I could make a living with just a deck of cards. And I could teach the natives on the island how to play poker.